Robert Zubrin new Mars mission proposal could be accomplished with three Falcon-9 Heavy launches. 1) deliver to Mars orbit an unmanned Dragon capsule with a kerosene/oxygen chemical rocket stage of sufficient power to drive it back to Earth. This is the Earth Return Vehicle. 2) deliver to the Martian surface an 11-ton payload consisting of a two-ton Mars Ascent Vehicle employing a single methane/oxygen rocket propulsion stage, a small automated chemical reactor system, three tons of surface exploration gear, and a 10-kilowatt power supply, which could be either nuclear or solar. The Mars Ascent Vehicle would carry 2.6 tons of methane in its propellant tanks, but not the nine tons of liquid oxygen required to burn it. Instead, the oxygen could be made over a 500-day period by using the chemical reactor to break down the carbon dioxide that composes 95% of the Martian atmosphere. Using technology to generate oxygen rather than transporting it saves a great deal of mass and provides power and unlimited oxygen once the crew arrives. Robert Zubrin’s ultralight Mars Mission proposal has generated some controversy. Over at NASASpacefight forum people have been debating the proposal. The main problems have to do with the Dragon’s capsules small size and issues regarding microgravity and radiation. Note: In the original Wall Street Journal article. Zubrin made the case that it was worthwhile to go to Mars at ten times lower cost with a not perfectly safe system using volunteers because the national choice for the other 90 billion could be used to save hundreds of thousands of lives. 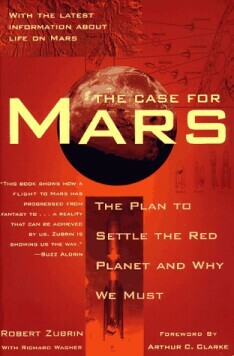 The Mars case was justified for uplifting of humanity but we had to go at a low cost. Volunteers would understand the risk. Dr Zubrin has posted his answers. 1. There is no need for zero gravity exposure. Artificial gravity can be provided to the crew by tethering the Dragon off the TMI stage, in the same way as is recommended in the baseline Mars Direct plan. 2. Cosmic ray radiation exposure for the crew is precisely THE SAME as that which would be received by those on any other credible Mars mission, all of which would use the 6 month Conjunction class trajectory to Mars, both because that is the point of diminishing returns (the “knee of the curve”) where delta-V trades off against trip time, and because it is uniquely the trajectory that provides a 2-year free return orbit after launch from Earth. Assuming the baseline mission, the total cosmic ray dose would be no greater than that already received by a half dozen cosmonauts and astronauts who participated in long duration missions on Mir or ISS, with no radiation induced health effects having been reported. (Cosmic ray dose rates on ISS are 50% those of interplanetary space. The Earth’s magnetic field does not shield effectively against cosmic rays. In fact, with a crew of 6, the current planned ISS program will inflict the equivalent of 30 man-years of interplanetary travel GCR doses on its crews over the next decade. This is an order of magnitude more than that which will be received by the crew of the mission proposed here. ) There are enough consumables on board to provide shielding against solar flares. 3. The preferred method of Mars capture is aerocapture, rather than direct entry. This means that the Dragon aeroshield, which has some lifting capability, may well be adequate. To see this with a back of the envelope calculation, consider a loaded Dragon system with an entry mass of 17000 kg, an effective shield diameter of 4 meters, a drag coeffecient of 1, coming in with an entry velocity of 6 km/s at an altitude of 33 km, where the Mars atmospheric density is 0.8 gm/m3. Setting drag equal to mass times deceleration, you can see that the system would decelerate at a speed of 42 m/s2, or a little over 4 gs. It could thus perform a 1 km/s deceleration in about 25 seconds, during which time it would travel about 140 km. This deceleration is sufficient to capture the spacecraft from an interplanetary trajectory into a loosely bound highly elliptical orbit around Mars. If the perigee is not raised, the craft will reenter again, and again, progressively lowering the apogee of its orbit, until either a desired apogee for orbital operations is achieved or the craft is committed to entry for purposes of landing. That said, if a larger aerobrake were desired, this could be created by adding either a flex-fabric or inflatable skirt to the Dragon core shield. 4. The habitable volume is admittedly lower than optimal. However it should be noted that with 5 cubic meters per crew member, it is 2.5 times higher than the 2 cubic meters per crew member possessed by Apollo crews. It could be expanded in space by the use of inflatable add-on modules. Extra space could be provided on the ground by using a 4th launch to preland another Dragon loaded with supplies, including one or more inflatable modules which could be set up by the crew after they land. 5. The mission architecture is much safer than any based on complex mega systems requiring orbital assembly, since the quality control of orbital assembly does not compare with that which can be accomplished on the ground. It would be better to have a crew of 4, but if we are to do it with Falcon 9 heavy’s, a crew of 2 is all we can do, and while it lacks a degree of redundancy otherwise desirable, it offers the counter benefit of putting the fewest number of people at risk on the first mission. It’s quite true that not flying anywhere at all would be safer, but if you want to get to Mars, you have to go to Mars. Here are further answers relating to concerns that have been advanced. As noted, if the Dragon capsule alone is used, this provides 5 m3 living volume per crew member, which compares to 2 m3 per crew on an Apollo capsule, 9 m3 per crew member on the Space Shuttle, or 8 m3 per crew member on a German U-Boat (Type VII, the fleet workhorse) during WWII. This would be uncomfortable, but ultimately, workable by a truly dedicated crew. However these limits can be transcended. The Dragon has a 14m3 cargo area hold below the aeroshield. Into this we could pack an inflatable hab module, in deflated form, but which if inflated, could be as much as 8 m in diameter and perhaps 10 m long, thereby providing 3 decks, with added volume of 502 m3 and a total floor space equal to 1.5 times as much as that in the Mars Society’s MDRS or FMARS stations, which have proved adequate in size for crews of 6. After Trans Mars injection, the Dragon would pull away from the cargo section and turn around, then return to mate its docking hatch with one in the inflatable. It would then pull the inflatable out of the cargo hold, much as the Apollo command module pulled out the LEM. The inflatable could then be inflated. The other end of the inflatable would be attached to the tether, which is connected to the TMI stage, for use in creating artificial gravity. Upon reaching Mars the inflatable could either be expended, along with the tether system and TMI stage, prior to aerocapture. Alternatively, and optimally, the tether and TMI stage alone would be expended, but the inflatable deflated and retained for redeployment as a ground hab after landing. Using just its aeroshield for deceleration, the Dragon would have a terminal velocity of around 340 m/s on Mars at low altitude (air density 16 gm/m3). So we could either give it a rocket delta-V capability of 600 m/s (a 20% mass hit assuming storable or RP/O2 propulsion, Isp~330 s) to land all propulsive, or we could use a drogue to slow it down (a 20 m diameter chute would slow it to ~70 m/s) and then employ a much smaller rocket delta-V for landing. If the Dragon descent capsule is replace by a more conventional dedicated Mars lander capable of delivering a small mobile habitat (perhaps in the same manner as MSL), then precision landing is not needed – and a great deal more exploration and science can be achieved. Over at MarsDrive, we spent a few years exploring just such a concept. Hi Robert. Good to see you on the forums! 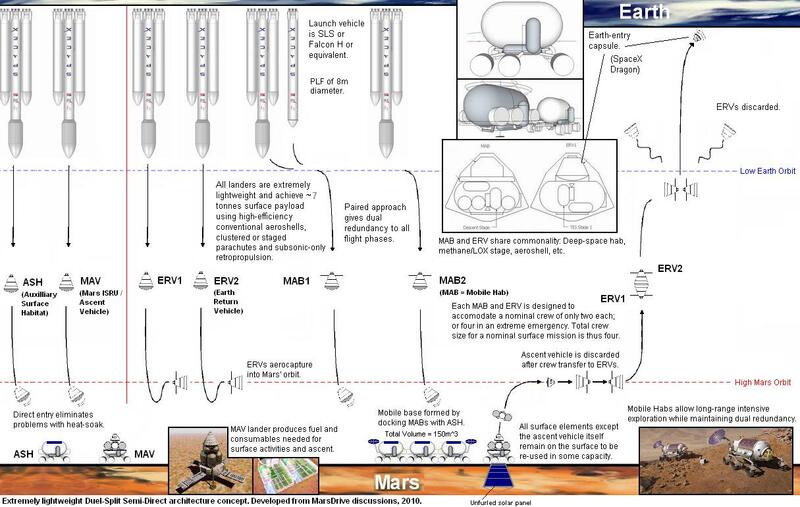 While I am sure that using a Dragon capsule as a Mars lander is possible, I wonder whether the development expenditure required – for the mechanical aids such a feat would require (retro-propulsive stage, aerodynamic decelerators, etc.) and re-engineering and qualification effort – would better be spent on the development of a more logical evolution of heritage Viking/MER/MSL EDL technologies to achieve the same performance? I imagine it would not be too difficult to scale up MSL-derived EDL tech to the point where its useable surface payload capacity is much better than that of a modified Dragon spacecraft such as the type that you propose? Such a purpose-built Mars lander might also serve the future needs of an initial Mars base much better and more cheaply than Dragon.